Riding & repairing Motoguzz, Riding my KTM dirt bike, Music of all types. 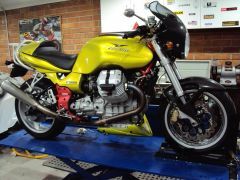 I have 2002 Moto Guzzi LE Mans Re vin ZGUKRAKR42M114723 Red. Has 60.000 KM I LIVE IN Canada. Bike has been off the road for two years. I am going to get it back on the road this year. Just needs front fork service and up dated springs, Rear shock needs service or replaced. I love the bike. I will add a photo later. I have been away from the sight for quite sometime as I could not remember my pass code but I found it now I am ok. I love the help everyone has been giving you. Just put a voltage meter on the battery and see if the battery is being charged. Check at idle and then rev the engine to 3000 rpm. Should read about 14.5 volts. Curiosity ?. V11 LeMans Long Distance Tire choice? I run pilot 3 very happy with them, Set tire pressures on the max for loaded riding. For shorter trips I lower the tire pressures. Love them in the rain. My 2002 LeMans needs new heavy front springs. Does not have Ohlins front forks. Does someone no wear to pick these up. I have factory fork seals. Thanks this is all good reading. I have a 2002 with 60,000km on the clock.i need to install heavier springs in the front and service both. Rear shock needs service also. Were can I get springs from. I set my bike up last year. I just used the voltage meter on the TPS. Your all seem to be missing one of the settings on the TPS. There are to spec one to start of and then your running spec. I have the factory manual also have a set of mercy gauges. Bike runs very well only problem when I get up in the mountains as I back the throttle of or light throttle there is a light popping out the throttle body's as soon as I get back down the mountain every thing is good. I think I need to get the cable and plug into to EMC and set the fuel trim. I do run a cooler spark plug also.
. Now you are a pro.